We are pleased to inform that Dhanyashri is recovering well. Thank you all for your prayers and support! 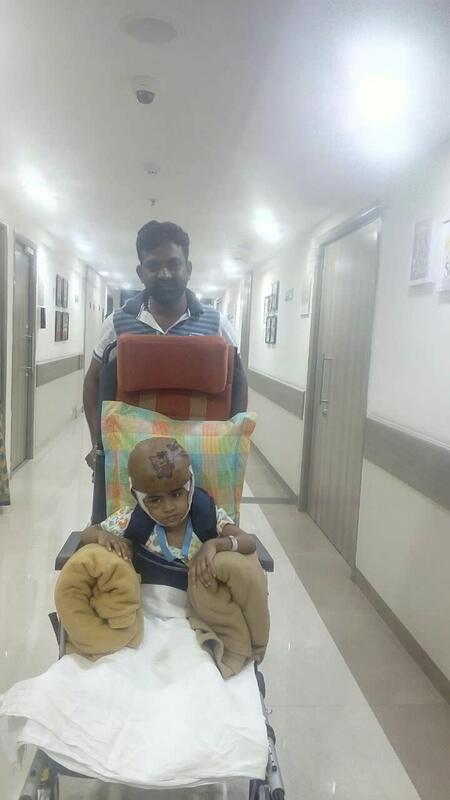 Two weeks after four-year-old Dhanyashri’s life was almost crushed in a freak accident, crowd funding helped collect Rs 20 lakh for the child’s treatment. The girl, from a lower middle class family, was injured recently after a man fell on top of her from his second-floor balcony in Tondiarpet. She had suffered a severe brain injury and multiple fractures on her spine. She was in a critical condition when she was admitted to a corporate hospital. The concussion had resulted in her brain swelling rapidly, which worsened over the days, and resulted in high brain pressure. Dhanyashri’s father C Sridhar sells water cans and her mother Yamuna Devi is a home maker, hence, the family of four is completely dependent on Sridhar’s meagre earnings. “We have no savings and had to seek help from friends and family to pay off the initial hospital fee. We were then advised to seek support via social media. Milaap, India’s largest crowdfunding website set up a goal of collecting Rs 20,00,000 and we started receiving funds,” Sridhar said. Health Minister Dr C Vijaya Baskar had also visited Dhanyashri twice and promised to help them financially, claimed sources. While the toddler remained unconscious for over 48 hours and the pressure in her brain increased, she was operated for an emergency decompression, after which she began to recover. “Dhanyashri opened her eyes and we were relieved. Our fear of her developing amnesia was also short lived when she immediately recognised us,” her father said. Today, the girl has a portion of her skull stored in the blood bank and has just a layer of skin to cover the upper portion of her brain. She wears a cap but has not complained of any pain. With a cast on her leg and a brace on her spine, she will stay at the hospital for a few days before she is discharged. Latest update on DhanyaShri health is now she is without her skull scalp and undergoing some treatment. After a month Dhanya will be undergoing a surgery to place her skull scalp again. And she is having slight crack in the bone under her eyes and slight bleeding in one of her eyes. Now she started taking food and she is able to speak a little and asked Doctors for a TV as she getting bored and requested for TV. Thanks for all your Support & Prayers. Keep you posted for further updates. Thank you for the overwhelming love and support that you have shown towards Dhanya. She is doing better now compared to earlier. She is able to speak and it is very slow and the doctors suggest that she will be able to speak better as she recovers. She is also able to recognize people and respond in a yes or no by nodding her head. She will still require a further stay in the hospital and is still under observation. Once her health stabilizes the doctors will be suggesting the future course of action. I would like to thank all of you once again and would request you to share this campaign further with your friends and family to help us in raising funds for her treatment. Do pray for her health and speedy recovery. Will keep you posted.